- Di ammonium phosphate crystal / powder - tech / pure / anhyd. - Di potassium phosphate crystal / powder - tech / pure / anhyd. - Di sodium phosphate crystal / powder - tech / pure / anhyd. Tip with steel ball. For all types of surfaces. Functions on wet, oily, greasy and rusted surfaces. UV resistant. Excellent water resistance. Functional over a wide temperature range. 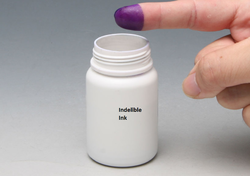 This is the ink used for elections, to mark the voters fingers. Backed with huge industry experience and market understanding, we are involved in providing a wide variety of Indelible Ink for our valued patrons. Standard Laboratories Indelible Ink is as per the Bureau of Indian Standards specifications No. Is-13209/1991.The Indelible Ink is uniform in appearance without any particles or sediments and will not coagulate or decompose. 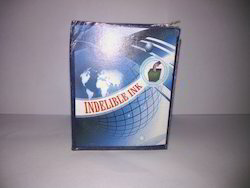 The Indelible Ink is tinted violet in color. A leader in Office and School Stationery products, Kores touched heights of global excellence in stationery ink and ball pen ink in the 1980s.Even as the company expanded its reach and product line. This product is manufactured as per bureau of Indian Standards specification (IS 13209/91) for easy application in elections. Our ink is widely used in India for Panchromatic and Municipal Elections. This product is manufactured as per bureau of Indian Standards specification (IS 13209/91) for easy application in elections. Our ink is widely used in India for Panchayat and Municipal Elections. We offer our client best variety of Blister Ink.